Beyond Pink Stripes: Kitaro Sushi: Japanese Food, Anyone? 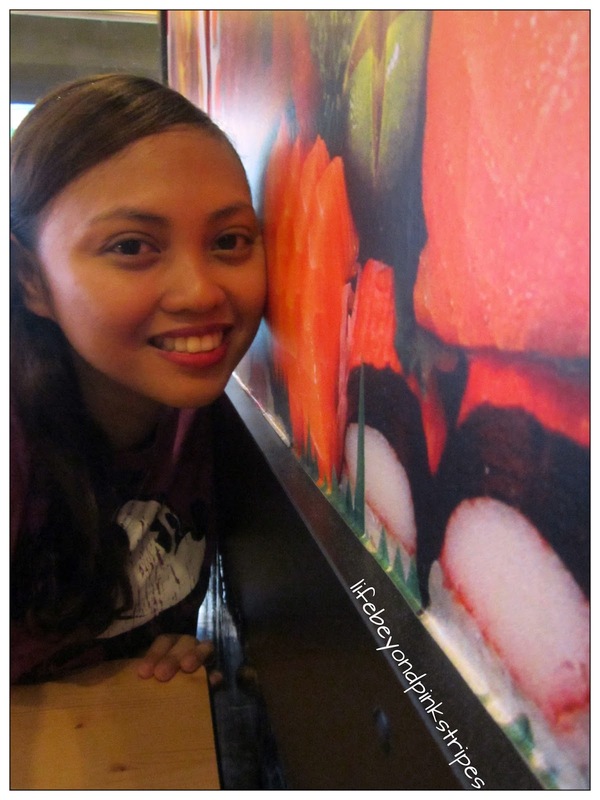 Kitaro Sushi: Japanese Food, Anyone? 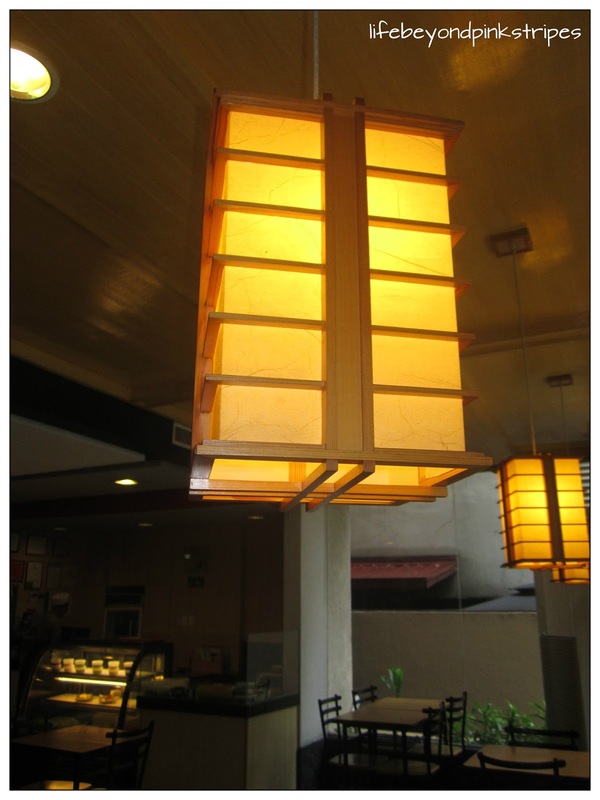 Spotlight is on ...KITARO SUSHI! 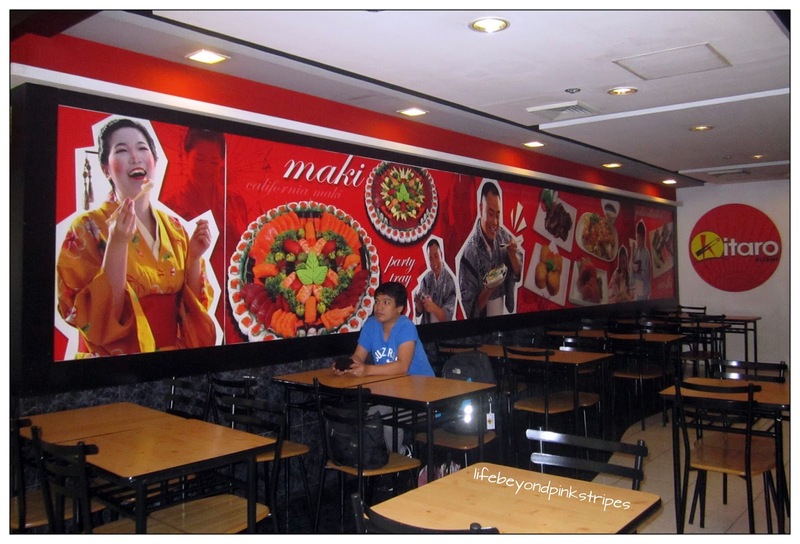 As the name suggests, it is a restaurant serving fares from the Land of the Rising Sun such as tempura, ramen, sashimi, and of course sushi. 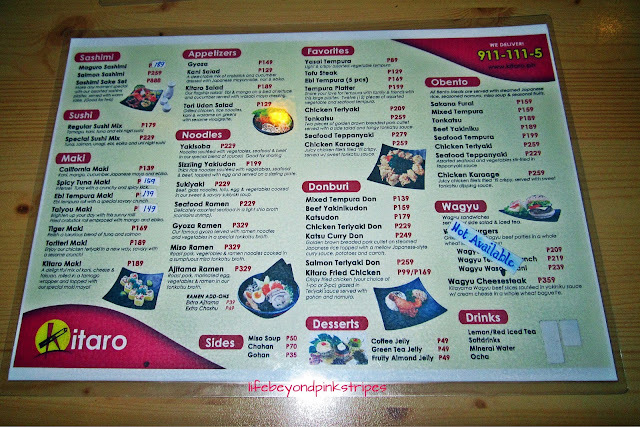 Recently, Hubby and I dropped by one of KITARO's branches (@Emerald Avenue, Ortigas) to satisfy our craving for Japanese cuisine. There were only a few diners at that time but since it's not fast food, we had to wait for a while before our orders were served. 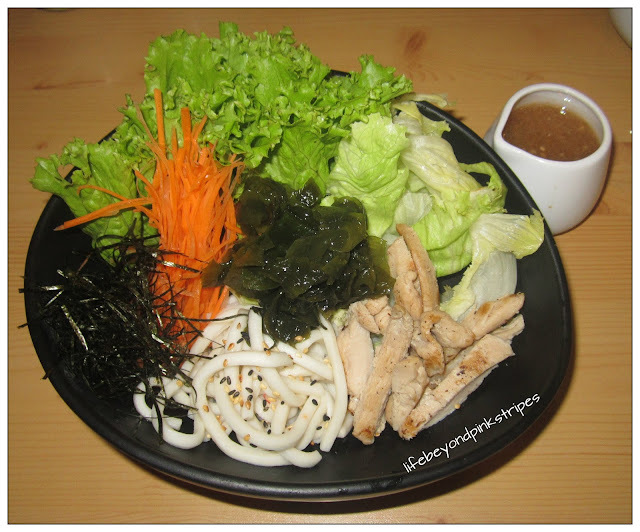 As soon as the dishes arrived, we inevitably felt like we were caught in a "gastronomic" battle, prompting us to eagerly "attack" on everything that was on our table using our not-so-secret "weapon" - chopsticks! LOL. If only for the generous serving of shrimp, squid and kani, I would give this ramen my all-out approval. However, I did not like the taste of shitake mushroom which was quite overpowering for me. 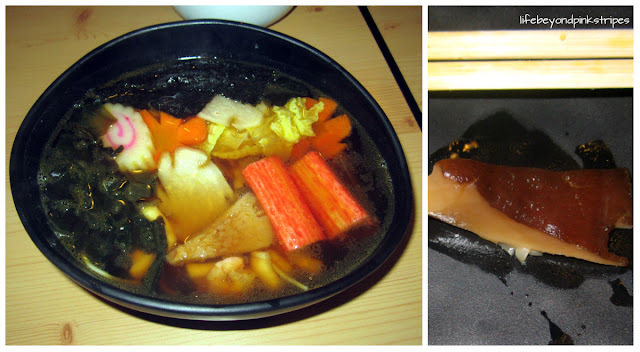 As for the Hubby, the ramen was not that hot for his liking. The "crunchy-on-the outside and soft-in-the inside" texture was perfect for me. The ginger soy sauce dip was ok but I actually dipped my tempura in the remaining sesame vinaigrette. And boy, was it sooooo delicious! Green Tea Jelly was fruity with only a hint of tea aftertaste. It had some nata de coco embedded in it. 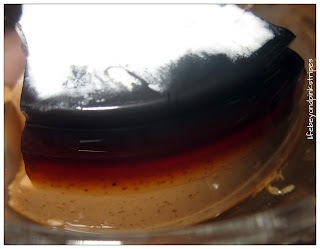 The two-layered Coffee Jelly was able to capture the true flavor of the aromatic drink. The firmer layer on top had a stronger taste and can be likened to black coffee. 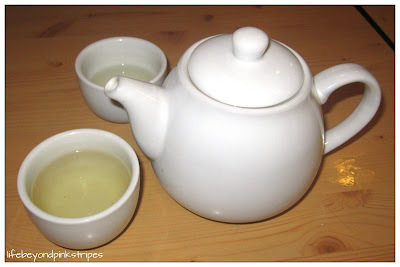 The bottom part was softer and had a milder taste as if creamer was added to the concoction. The sweetest part of our meal, literally. 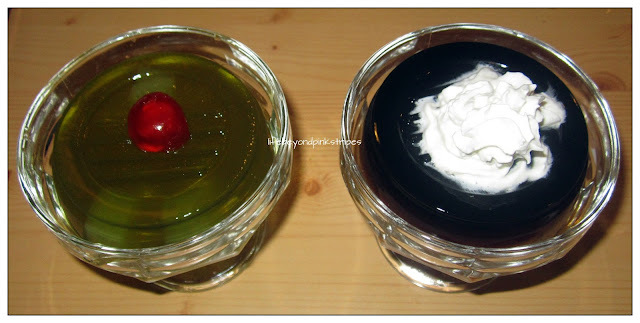 Both jelly variants surpassed our expectation in terms of taste. 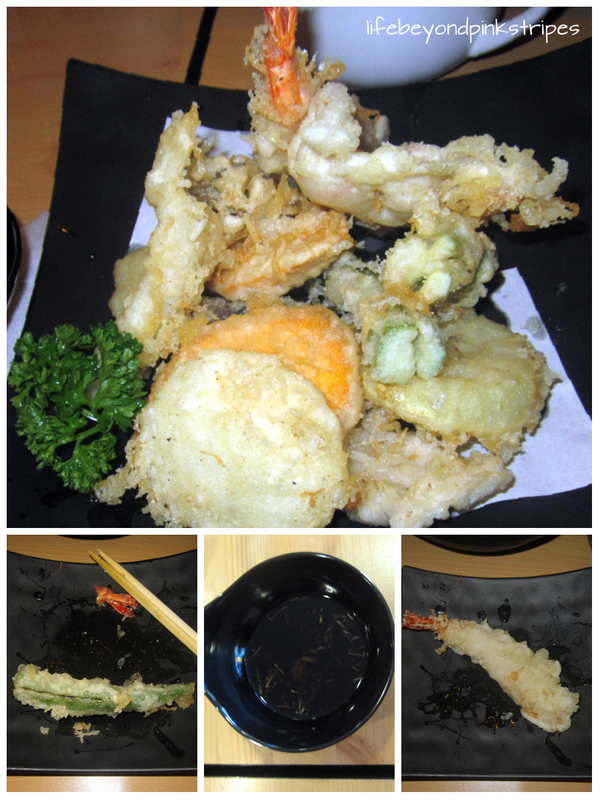 We left KITARO SUSHI with heavy but truly satisfied tummies. For more information on KITARO SUSHI, click here.